Review: About Time / It's Just Movies Review: "About Time"
An expert at the rom-com formula, Richard Curtis is back with an all-new film. 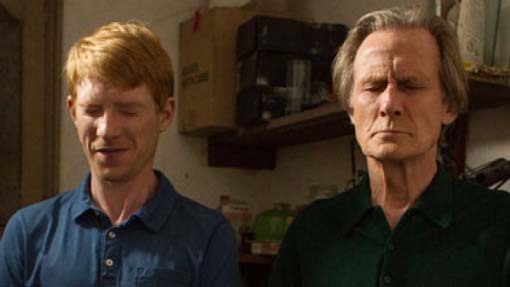 Curtis wrote and directed “About Time,” which tells the story of privileged man named Tim Lake (Domhnall Gleeson) who gets told a secret on his 21st birthday by his father (Bill Nighy). Tim learns the men in his family can travel back in time. Now they can’t do anything drastic. They can back to any moment in their life just by closing themselves in a dark area and imagining the moment they wish to visit. The few rules are that they can’t affect death and once a child is born, they cannot travel past their birth without changing who the baby will become. A quiet, awkward lawyer-in-training, Tim’s first thoughts are about how he can use this newfound power to help himself get a girlfriend. After a few mishaps with some local girls and things not working out, he moves to London to pursue his schooling and moves in with an acquaintance of his father, Harry (Tom Hollander), an eccentric playwright. Tim then meets Mary (Rachel McAdams), with whom he falls instantly in love and manages to get her number. When Harry’s show opens to disastrous reviews, Tim goes back in time to fix it, only to find out he doesn’t have Mary’s number anymore because in this new timeline they haven’t met. He must do all he can to try to fix his mistake and once he does find her, he must charm her all over again. But with every personal triumph, there is a disaster or tragedy waiting around the corner. Tim must continue to choose whether or not it is worth losing some of the good things to chance going back in time to stop the bad from happening. “About Time” can easily be compared to Richard Curtis previous films, with correlations and similarities to previous characters, quirks and storylines, but just because it has a hint of familiarity does that make it any less enjoyable? I don’t think so. The film is about happiness, living the best life possible, dealing with the sadness and righting past mistakes. It is relatable on a basic human level and I bet we all have a few moments in our own history that we wish we could go back and change. Mixing elements of “Groundhogs Day” with the similar “Time Traveler’s Wife” — which also starred McAdams — we get sci-fi elements mixed in with the emotional aspects of a drama. It’s a drama about relationships, with the main one being a father and son. Some may argue that the relationship between Mary and Tim is the central one, but I felt more compelled towards the scenes between Domhnall Gleeson and Bill Nighy. The love angle is sufficient and I enjoyed seeing Domhnall in a starring role; he was sympathetic, compelling and charming. As usual, McAdams was good and her chemistry with Gleeson was there. Bill Nighy plays a strong central character and brought so much to his role. They are many supporting characters that added to the film’s dimensionality, including Lydia Wilson as Tim’s free-spirited sister, Lindsay Duncan as his mother, Will Merrick as Tim’s best friend Jay, as well as Joshua McGuire, Vanessa Kirby and Margot Robbie, all of whom were delightful in their respective roles. Just as he always has, Curtis infuses “About Time” with lush British-isms as well as some very moving, funny, heartfelt moments. It truly is a film with many aspects to it. There are so many scenes that cover a range of emotions and aspects of life that at the beginning might have been hard to relive, but by the end you come to realize you can’t escape all the pain, and even those hard moments help shape who you are into who you might become. Are there some minor plot holes? Sure, but overall the film is paced so well and is so funny and touching that most movie-goers probably wouldn’t even notice them. Some of the rules of time travel aren’t super clear right away – and in moments of high dramatic impact our protagonist seems to break some of the rules – but they are minor infractions in a well-done film. The bottom line is that “About Time” is a fine film that will bring you back to moments of nostalgia and make you reminisce about your own history, the relationships in your life, dealing with love and loss as well as shaping your destiny. It is a fun concept wrapped up in a dramatic storyline and sprinkled with humor to leave you feeling good as you leave. There are also many sad moments, but the film is so well balanced it doesn’t leave you feeling sad in the end. This is a great date film for anyone who wants to bring their significant other to the theater and I feel like it would have done very well being released closer to Valentine’s Day. However, it should still do just fine by the fan base Richard Curtis has accrued over the years on many different continents. 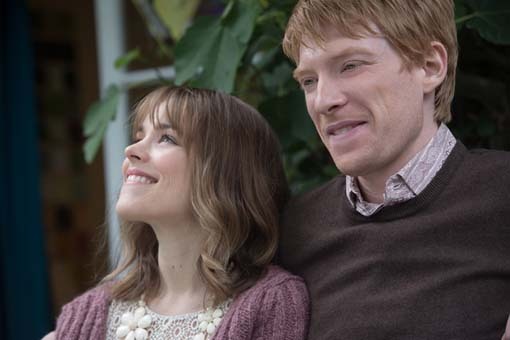 “About Time” opens in theaters Nov. 8 and is rated R for some language and content. You can see a poster and some trailers for the movie by clicking HERE.